Able to handle the shock and vibration found in jet skis/quad bikes it can operate in any orientation and is typically used in the Ultima supercar, but also perfect for use in Lotus 7 inspired cars such as the Caterham and Westfield. 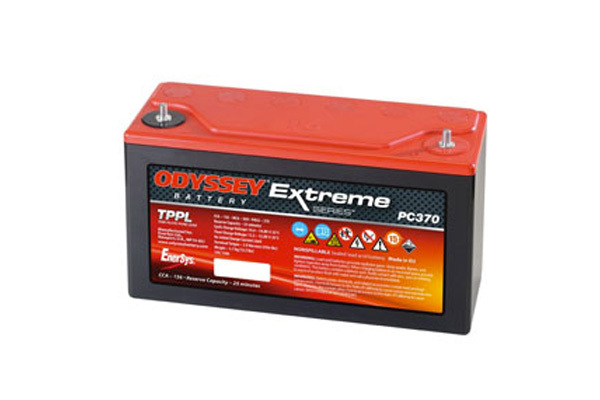 A popular pack the ODYSSEY PC370 Pure Lead TPT (thin plate technology ) gives this battery a superb power/weight ratio (watts per kilogram) Exceptionally good anti-vibration properties with fast recharge capability and recovery from heavy discharge. Can be mounted upright or flat. Design life of 8-10 years. Able to handle the shock and vibration found in Jet Skis and Quad Bikes it can operate in any orientation. (although fully inverted is not recommended) Typically used in the Ultima supercar, it is perfect for use in Lotus 7 inspired cars such as the Caterham and Westfield particularly those using motorbike engines. The ODYSSEY PC370 has also been the battery of choice for Formula Ford as well as many other single seater categories.